Maintaining your tires is an important aspect of car safety and efficiency. By neglecting to care for your tires you are essentially throwing money away. 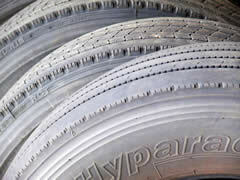 By properly caring for your tires you will improve your car's overall handling, performance, and even its gas mileage. Maintaining your tires is simple, and taking the required five minutes to do it will end up potentially saving you hundreds of dollars. So what do you need to do to ensure that you achieve the maximum performance from your tires? Let's run through three of the most critical factors when it comes to maintaining and servicing your tires. One of the most common causes of eventual tire failure is incorrect air pressure. Your tires have a specific psi value that should be maintained consistently. This value is outlined in the owner's manual. It is common for tires to lose 1 psi per month, which makes a monthly inspection critical. After months of negligence, tires can become severely underinflated. When a tire is underinflated it creates a larger surface area that will contact the road. This increased contact will result in excessive heat and friction, which will wear your tires down quickly and cause your car to be less fuel-efficient. In contrast, it is important not to over inflate your tires, as this will cause an imbalance and will result in the over loading of certain tires. This can lead to blowouts, and is extremely dangerous. To be safe, buy a small pressure reader and ensure that all tires are uniformly inflated. Another way to greatly extend the life of you tires is to have them rotated. However, if you choose to take the DIY approach be sure to utilize the correct method. There are four different rotation patterns: front wheel drive, rear wheel drive, 4-wheel drive, and uni-directional. Since most vehicles have front and rear wheel drive we will outline the proper technique. If you own a rear wheel drive vehicle the proper rotation is as follows: First take the back left and back right tires off. Next, remove the front left tire and secure it in the back right tire position. The front right tire will now serve as the back left tire, and the previous back left and right tires will simply move up into their corresponding positions. If you own a front wheel drive vehicle the process is the same, but now the back wheels will alternate sides. The final factor for tire safety is ensuring proper balance and alignment. This is something that is a potential safety hazard and should be done by your mechanic. However, it is important to understand why these steps are necessary. A properly balance wheel provides for a smooth and quite ride, while an imbalanced wheel will shake, bounce, and wobble during use. This will cause stress on your vehicle, and can affect more than just your tires. To balance a tire properly your mechanic will use a balancing machine to analyze the tires weight distribution. He will then fix weights to the inside of the tire to counterbalance any weight fluctuations. Alignment is the adjustment of your front and back suspension. By being misaligned, tires will make contact with the road that is not ideal, which will lead to unnecessary wear. There are three types of misalignment: Caster, Camber, and Toe. Knowing this terminology is less important than knowing when to check your alignment. Most cars will have scheduled check ups, but if you hit something (even lightly), notice strange wear patterns, or can feel a difference in the way your vehicle is handling you should check the alignment immediately. Performing these simple tasks is incredibly easy and takes almost no time. These proactive steps will ultimately save you money and keep you safe.